As the festive season begins, it's time for the Christmas parties to start and plenty of evening celebrations to look forward to. I like to wear colours and prints that fit in with the festive theme, for example a classic red lip and pops of red in my outfit. I have quite a few Christmas parties to attend this year and I've been really organised and started planning all of my outfits. 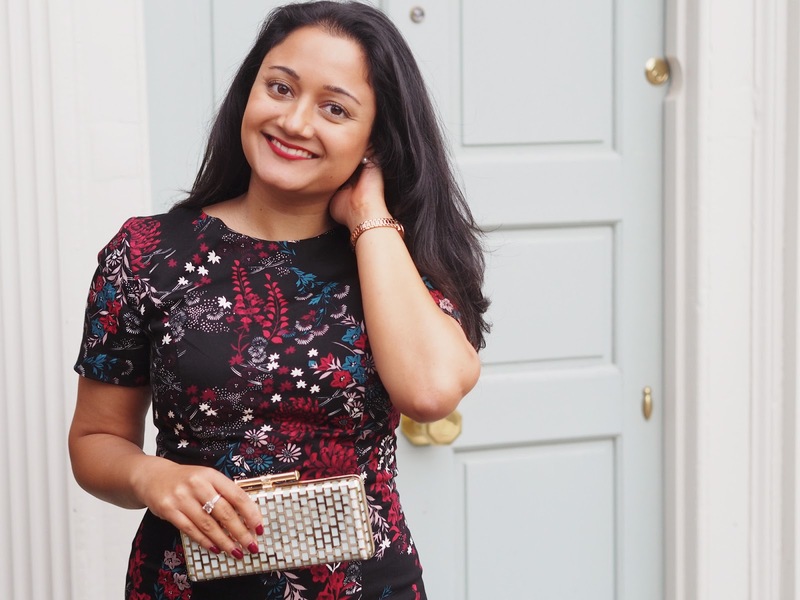 Read on for my tips on dressing up for Christmas and the festive season. 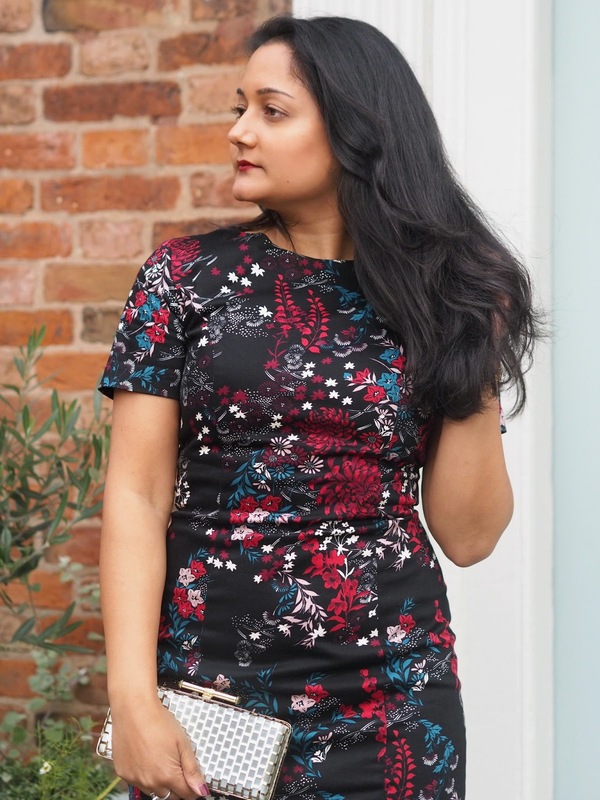 This black and printed dress from New Look is really flattering for my figure, as it fits nicely at the waist and falls just above my knee. 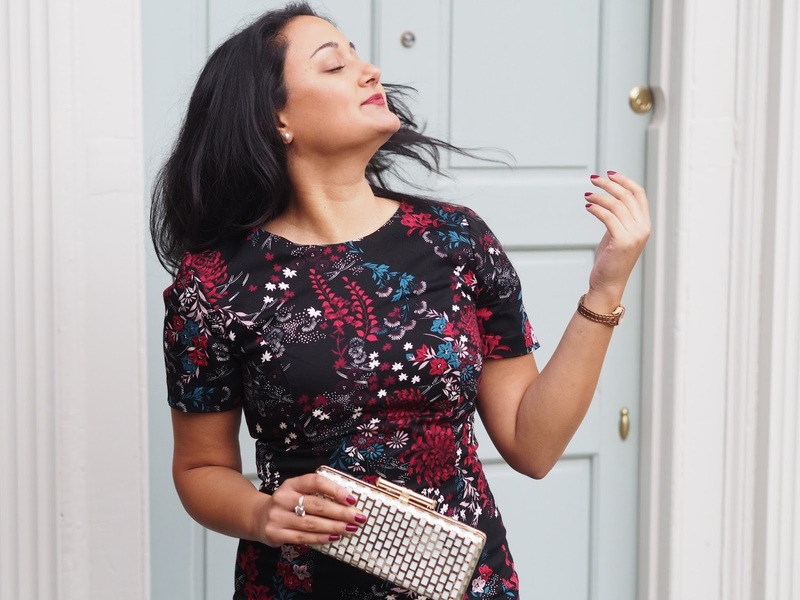 Choosing an outfit that is fitted in the right places for you makes all the difference as it enhances your figure and for me, it makes me feel so much more confident. Incorporating the classic festive colours such as reds, greens and whites into your outfit can instantly make your whole look more festive but in a subtle way. The dress I bought actually already has a lovely floral print with pops of colour, including red, which is perfect for this season. As you all know, accessories in any outfit are my favourite things to style. In this outfit, I wore my gold clutch bag from TK Maxx and my Hugo Boss watch. 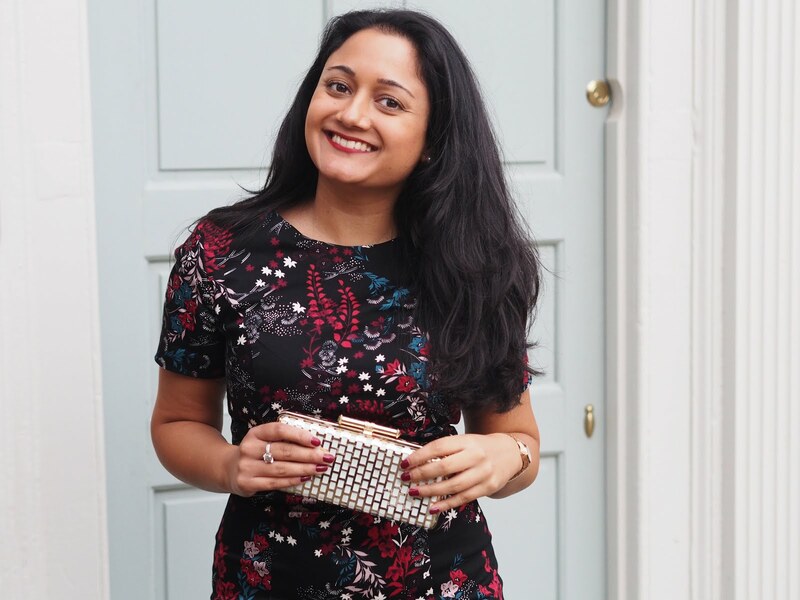 For an evening out, this clutch bag is great as it's small but still fits all of your essentials. What I like most about it is the unusual design and the fact that the gold colour really stands out. By choosing accessories that are eye catching, your whole outfit is automatically made to look more high end and suitable for an evening out. In my opinion, you can never go wrong with a classic red lip. I love wearing red lipstick in the winter and around Christmas time, as it's perfect for a night out or a party. With this dress, I really felt that this matte red lipstick by Revlon brought the colours out. Wear make up that you're comfortable with, but if you are looking to add more colour, I think Christmas time is the best time to give it a go! How do you like to dress up during Christmas and the festive season?